There may come a day soon when the modern office as we know it ceases to exist. Indeed, one fast-growing trend among young professionals is the practice of working from home. A classy and eloquent alternative to the ‘man cave’, the gentleman’s study is a quintessentially British phenomenon that any self-respecting bachelor, or businessmen would not be without. Historically, the study was a room reserved as an escape for the hardworking ‘man of the house’. Here, the gent could kick back and relax, away from his children and wife, indulge in a cigar and a glass of scotch, whilst attending to any business-matters. When you finally decide to move to a new home or city, you’ll most likely get mixed feelings. You may feel excited as you look forward to enjoying your new environment, but you’ll also probably start to feel nostalgia as you remember all of the good times shared in your current home. However, the most worrying of all on moving day is that dreadful feeling of packing up your belongings and transporting them to your new place. Someone once said that a good way to learn discipline is by taking care of a plant. That’s why in some movies, you’ll find the really deep and disciplined spies or hitmen with plants, which they ensure is always in good shape. On the other hand, taking care of a plant can be a relaxing and enjoyable experience for some people. I bet very few people will fall under the former example, but many will agree with the latter instance. Are you an outdoorsy kind of person, or more of a homebody? Perhaps you fall somewhere in between. You enjoy spending time at home and tending to your nest, but you get a bit fidgety if you spend 24 hours cooped up inside. You’re not alone! Many people enjoy being outdoors not for the sense of adventure but for the healing effects being surrounded by natural greenery brings. Winter is here and you’ve probably already switched on your central heating. It might be working now, but how can you be sure that it continues to do so all throughout winter? By regularly and properly maintaining your heating system and all its parts. A major issue for homeowners, especially as the colder seasons approach, is trapped humidity causing dampness to spread through their homes and cause quite a havoc. It depends on the maintenance of your home and if it was not maintained well, the problem will be more common for you. 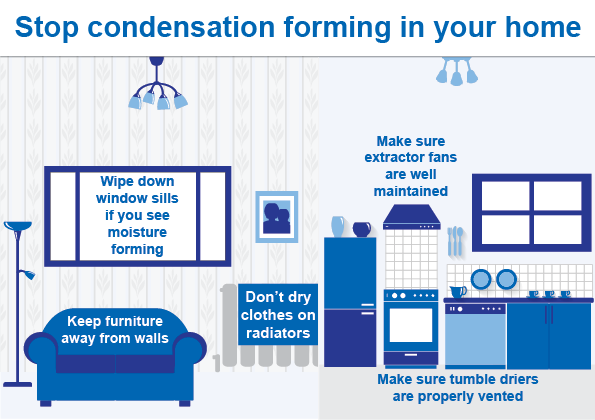 Moisture is meant to be kept in the room as condensation and because it’s not, the moisture passes from room to room and will seep into the internal and external parts of the home. Working from home without a home office can be quite challenging when it comes to being productive. Distractions like family members, pets, the television, and being in an overly relaxed environment can impede your work ethic and can lead to unproductivity. So, if you’re regularly working from home, but you need a place to focus, here are 5 helpful tips to help you set up you home office. We live in a day and age where working from home has become the preferred means of working, from both the point of view of companies and employees. Working from home is very good for the employees”health and productivity, and it is also a more affordable method of hiring people for corporations, as they don’t have to spend money arranging the workplace and fitting it for work. There is no doubt that more and more employees decide to quit their jobs and start their own home-based businesses or become creative writers, SEO professionals or web designers. However, it is also true that more and more companies prefer to let their employees work from home and monitor them using various computer programs. The reason for this migration is simple – more comfort, more money and more freedom. Add to this the savings on gas and the possibility to do whatever you wish with your time. How to Make Money Online with Online Auction Sites? Our current economy is causing many people to find different ways of making money. For many of these people they are turning to the internet to find ways to replace lost income. The problem is learning how to make money online. There are so many ways to make money using the internet it can be overwhelming trying to choose the best method, and avoiding scams in the process. We will discuss one of the oldest ways to make money online. People have been making money by selling various products at online auction sites since eBay first came on the scene years ago. There are several reasons why this is such a popular method of earning money online. Selling online is easy to get started, you do not need much in the way of special tools or training, there is very little in the way of start-up cost, and if you are persistent you can make a lot of money. As with anything there are pros, cons, and problems to contend with, especially when you are first starting. Let us look at some of the things you will need to consider when learning how to make money online using online auctions. We will start with finding a product to sell. We are starting here because for most people this is their biggest hurdle. There are several methods of finding products, and like everything else there are pros and cons to each method. The first method many online sellers use to find products to sell is to buy items cheap at local yard sales and auction houses. The pros of this method is that you can get items cheap, this increases your profitability. In most areas of the country there are several auctions to attend each week giving you a never-ending supply of goods to sell. You will find a variety of products to sell making your online store more appealing to more potential customers. The drawbacks of this method are that you are using your time and gas traveling to the auctions and yard sales. You may find that you need to spend time cleaning or repairing some of your treasures to make them presentable. The last thing is that you will have to take care of shipping on your own, this can be a time-consuming and expensive task for those that live in rural areas.The next method of supplying your online store is to make something on your own. Many people who like to do crafts have made a lucrative career selling their homemade products online. The main pro of this supply line is that you can control how much it cost to make the item, and how many you make. The main drawback is shipping. One of the hottest methods people use to supply their online auction store is to set up an account with a drop-shipper. There are many advantages to this method of finding products. First, you will have a continuous supply of products at a very low price. You do not need to run around looking for products, and you do not need to do the work of creating a product. Most drop-shippers now ship the products you sell directly from their warehouse to your customer, and they use your shipping labels. This makes your customer think that you shipped the item from your home. One of the biggest drawbacks of this supply line is finding something new and interesting to sell. This is such a popular method for online sellers to supply their online auctions it can be difficult to find products that are not already for sale all over the auction sites. There are other things you need to consider when learning how to make money online with online auctions. You will need to set up an account with your preferred auction site. You will need to start a PayPal account. You will need to be concerned with security, this usually consist of making strong passwords for your accounts and changing them often. The internet is full of stories about people being ripped off when their accounts are hacked.Advertising your online auction site is a fairly new thing you will need to think about. In the past, online sellers did not have many ways to advertise their site, they just relied on the fact that many thousands of people would browse the auction site each hour of the day. Now, to be a successful seller you need to take advantage of advertising your site on the social media sites. It is easy to do, and can draw a lot of customers to your specific online auction page. These are just a few of the things to know and be aware of when learning how to make money online with online auction sites.